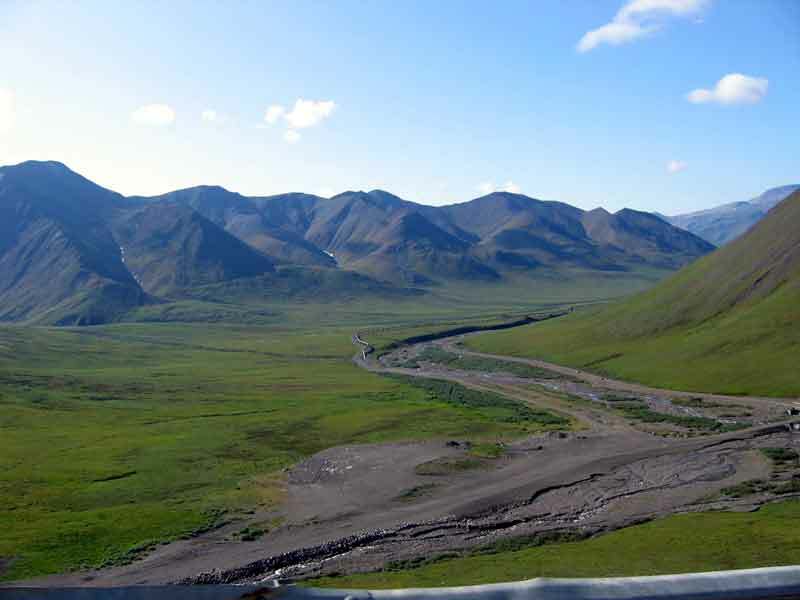 This highway was completed in 1977 and was originally called the Haul Road because it was how everything that supported the oil development at Prudhoe Bay was "hauled" there. 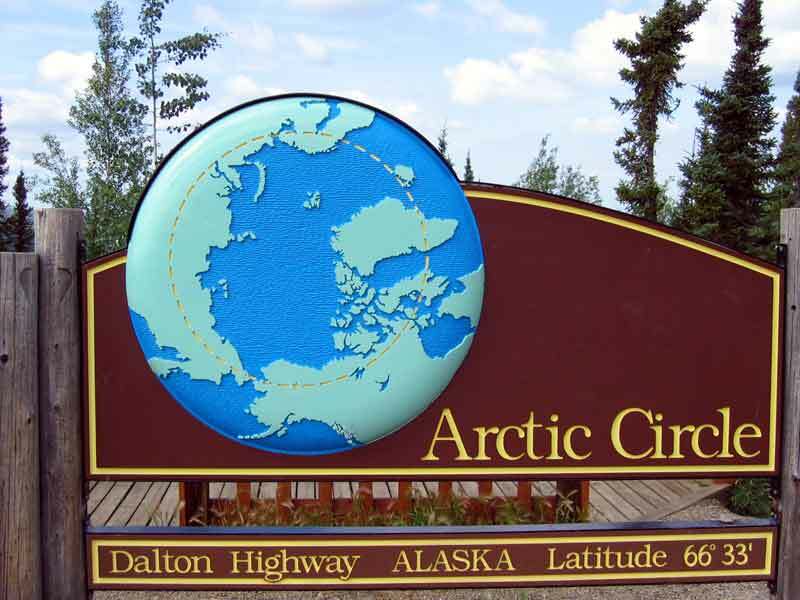 Today it is called the Dalton Highway and is a primitive road that begins about 84 miles north of Fairbanks and runs for 414 miles to Deadhorse, an industrial camp at Prudhoe Bay. 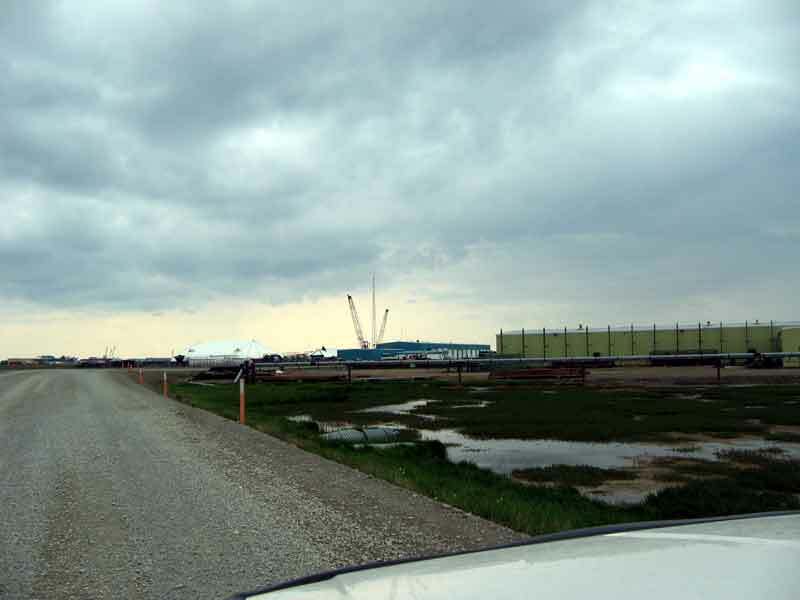 Actually, most of the folks at Prudhoe Bay still call it the Haul Road. 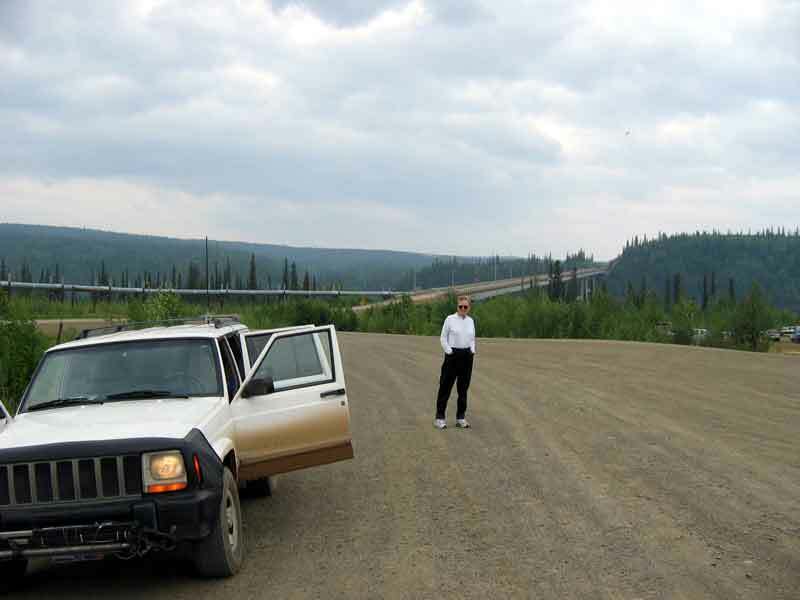 We drove this 500 miles of highway and can say that it is a beautiful but ugly road. 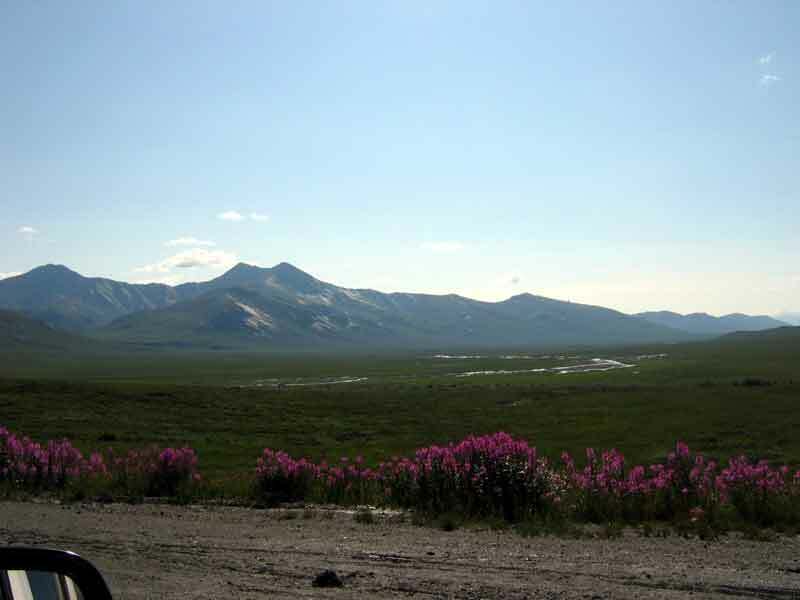 About 100 miles of the Haul Road is paved but the rest is dirty and brutal, but the scenery going through the Brooks Range, north of Coldfoot, is fantastic. 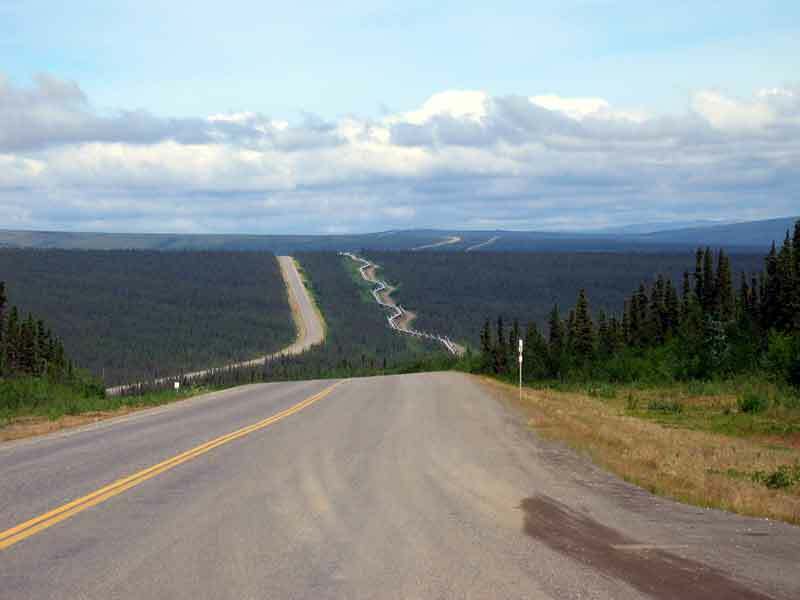 The first 84 miles of this journey is over the paved Steese and Elliot highways from Fairbanks to the start of the Dalton. 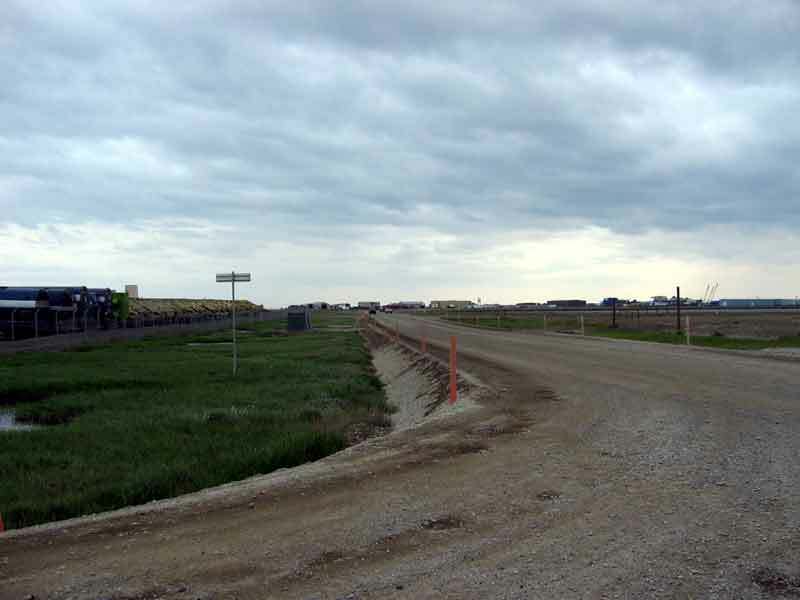 This highway is continually undergoing maintenance in the form of graders and their supporting water trucks. 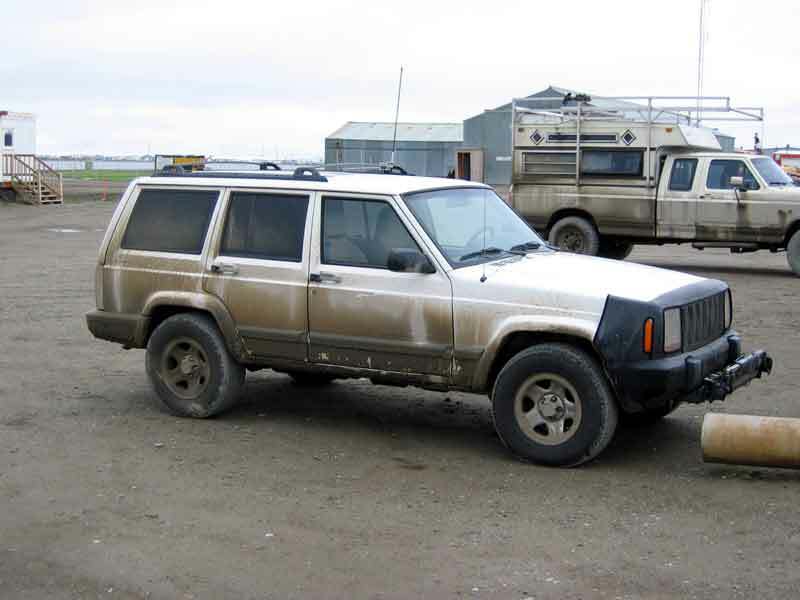 This makes for some slippery and dirty going and also creates situations that are dangerous to your tires. We went over some soft road right after it had been graded and encountered a "road hazard" that destroyed the sidewall of one of our tires. 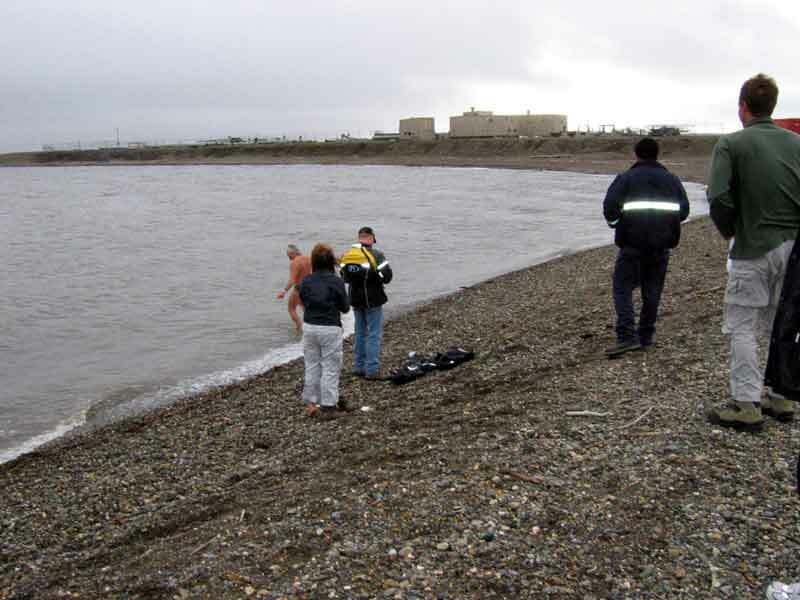 This happened about 90 miles south of Prudhoe Bay on our way north. 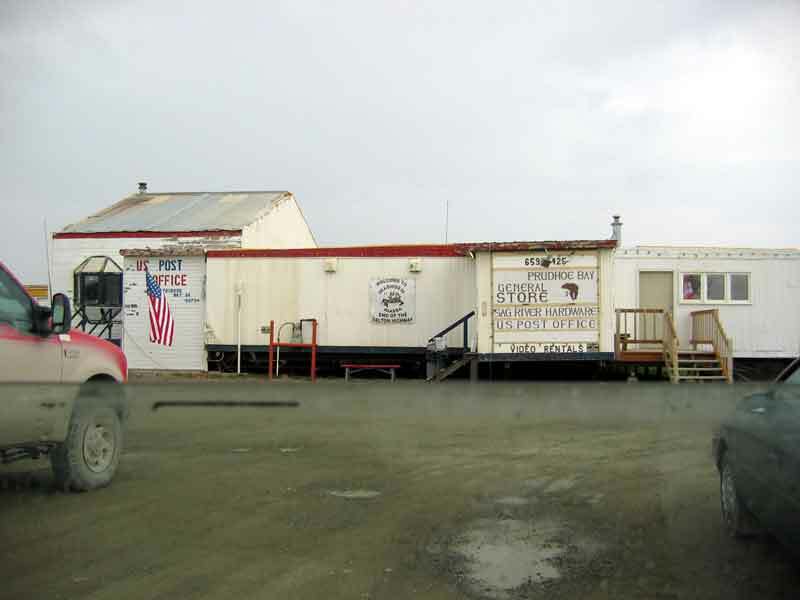 We were able to get the tire replaced there before our trip back to Fairbanks. 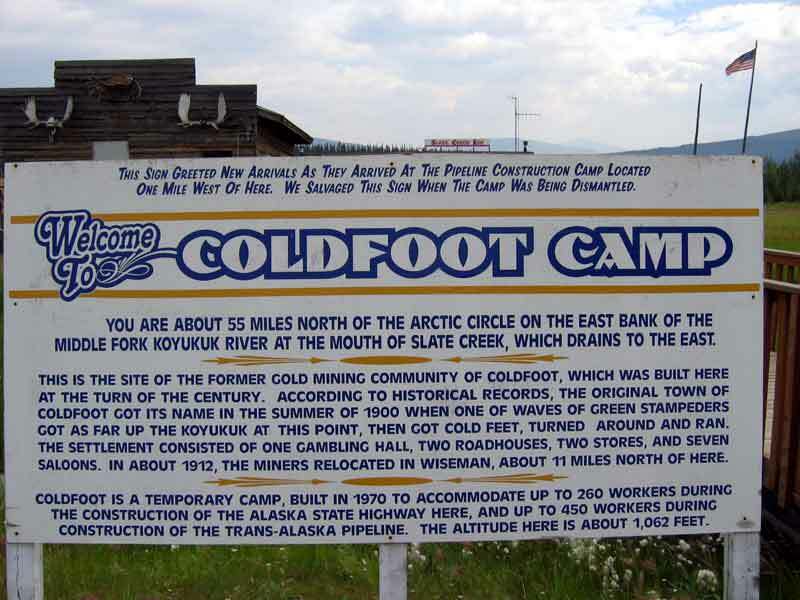 Right: Coldfoot Camp is about half way to Deadhorse"
Coldfoot Camp is the fuel and rest stop on the Haul Road. It has a garage, a kitchen, a saloon and rooms. 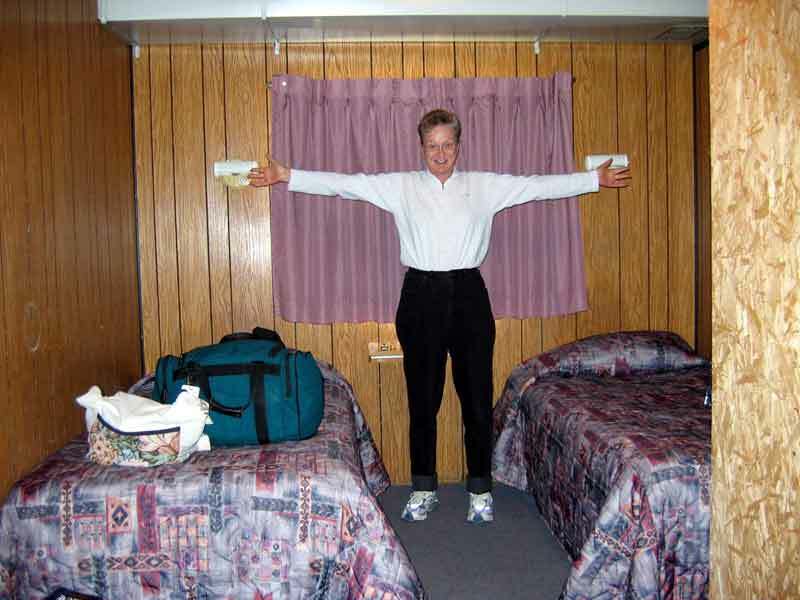 The rooms at the Inn are small with two beds each and a small bathroom. 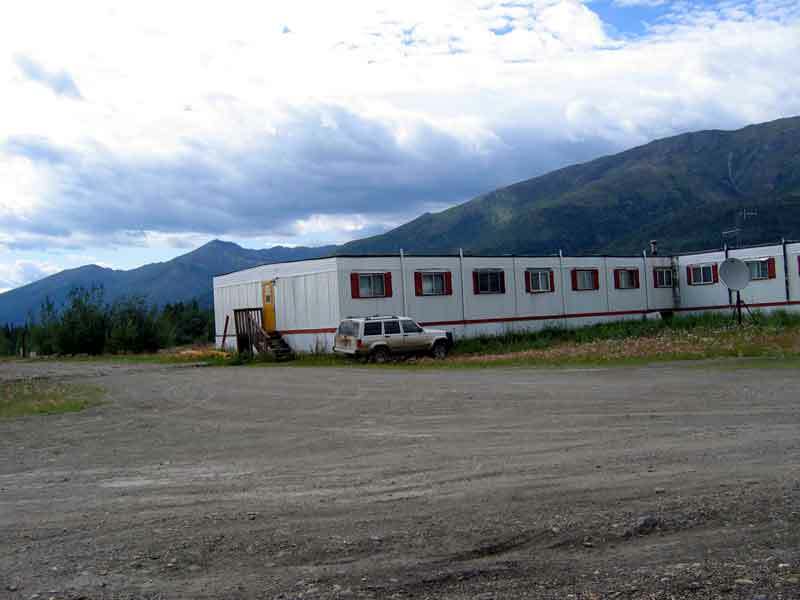 The building is a prefab affair where you assemble modules to make up what you want. There weren't a lot of people stopping here - price might have been a deterrent. 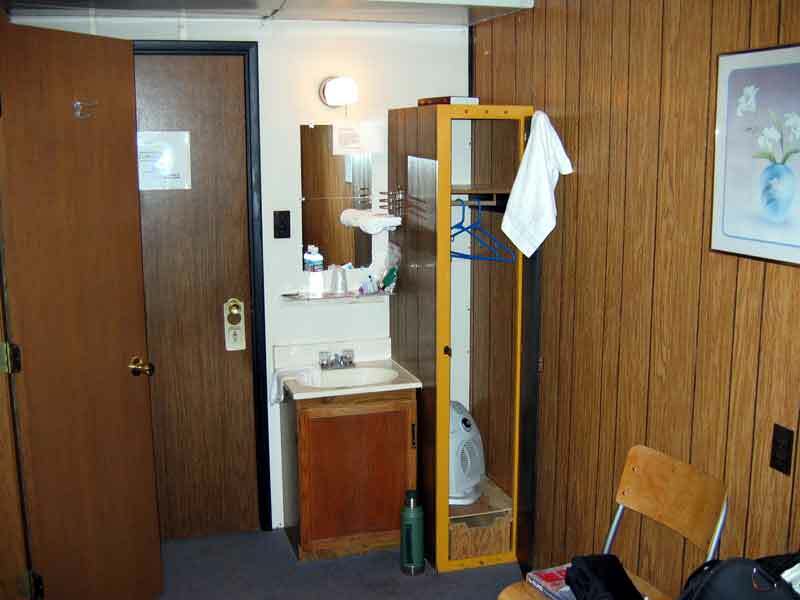 Just as a reality check, the price of this wonderful room was $145 per night! 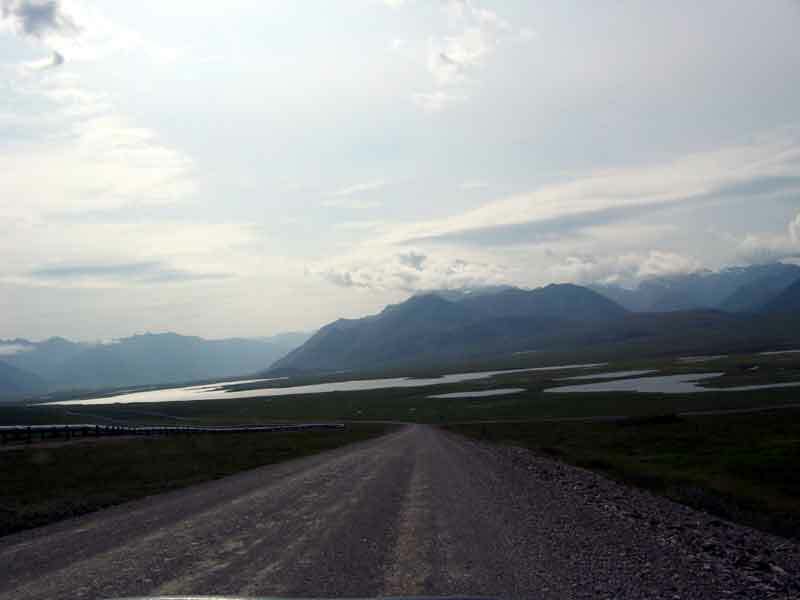 Left: Looking south as we head up to the Atigun Pass. The pipeline goes underground for the trip over the pass. 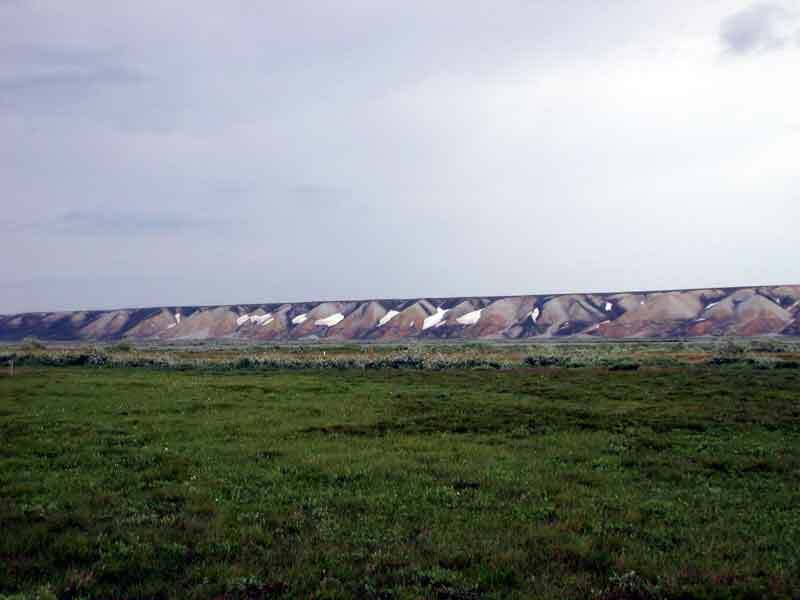 Right: Some cliffs with multicolored faces and some left over snow. 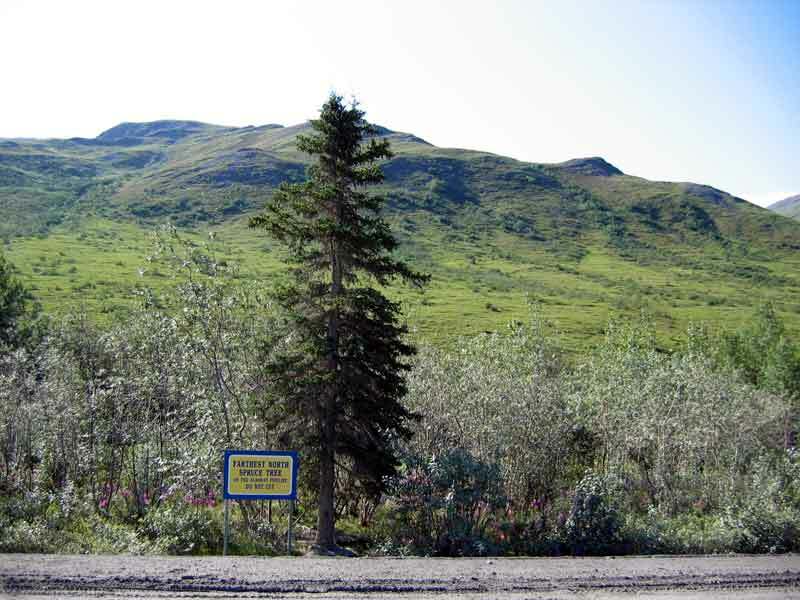 Deadhorse is the end of the Dalton with a permanent population of 25 with 3500 - 5000 part-time, depending on oil production and other related activities. 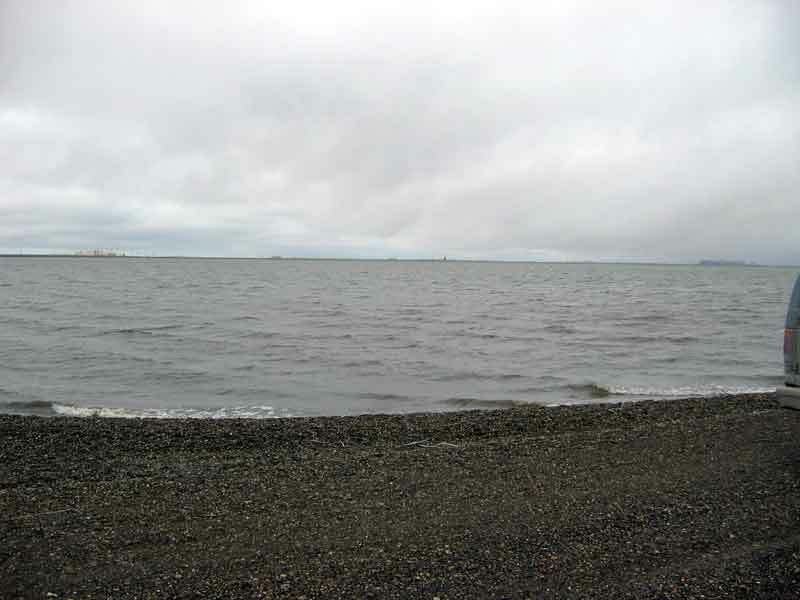 Prudhoe Bay is spread across about 25 miles and is the location of the largest oil field in the United States. 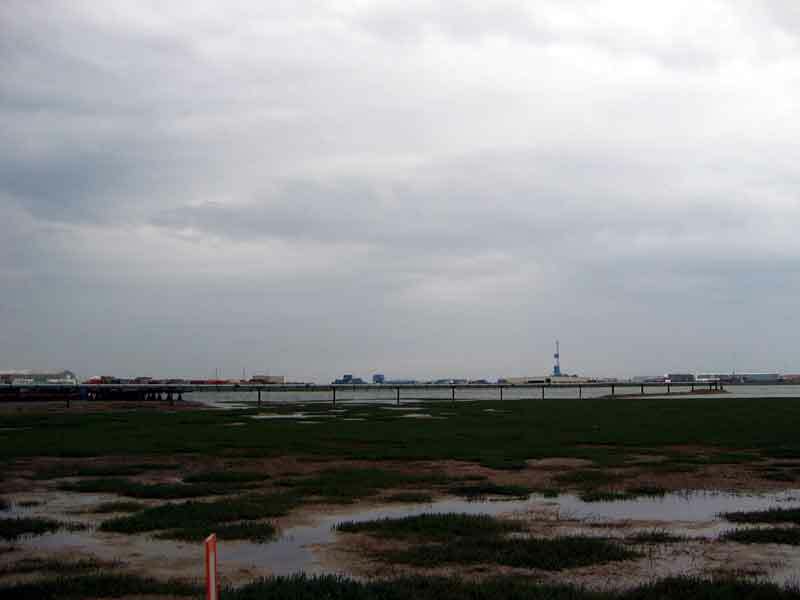 Most buildings are modular, having been brought in by barge and assembled here. 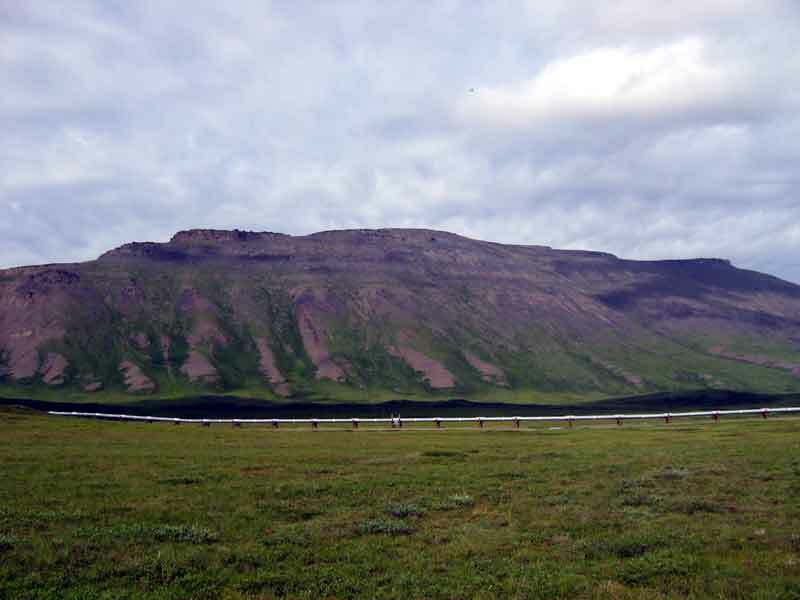 They are placed on gravel pads built to cover the tundra bogs and permafrost that make up most of the area. Even the roads are constructed this way. The bogs are ideal for migrating birds. All businesses here support the oil field and the pipeline. Employees usually work a rotation of two weeks on and two off. 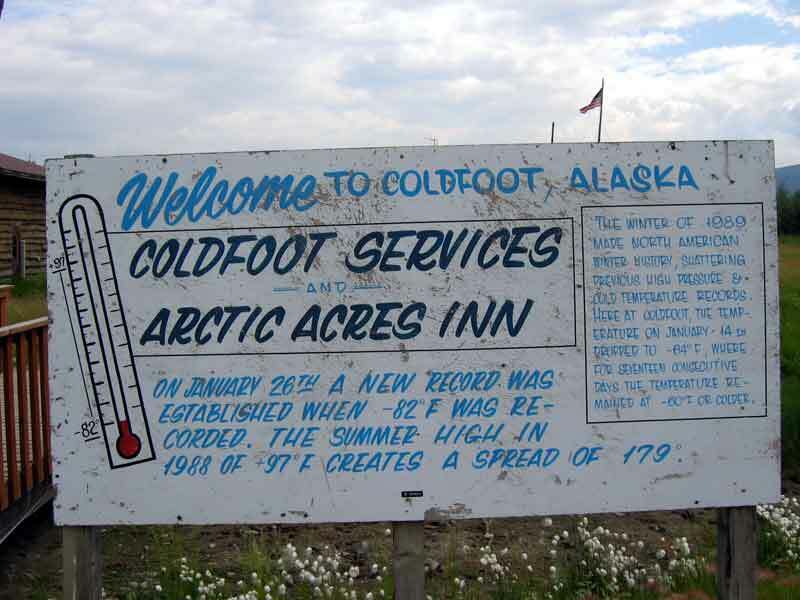 They work a 12 hours per day, 7 days a week, shift for two weeks and then are flown to either Anchorage or Fairbanks for their two weeks off. 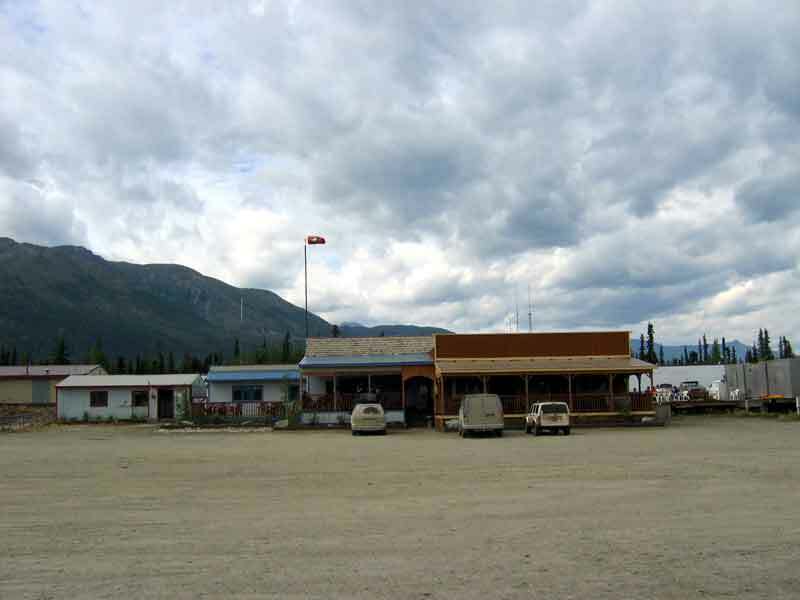 There are no banks or ATMs in Deadhorse and it is dry. They used to have alcohol available but there were just too many incidents and a few years ago the borough instituted a ban. Even just possession of alcohol is a very serious offense. 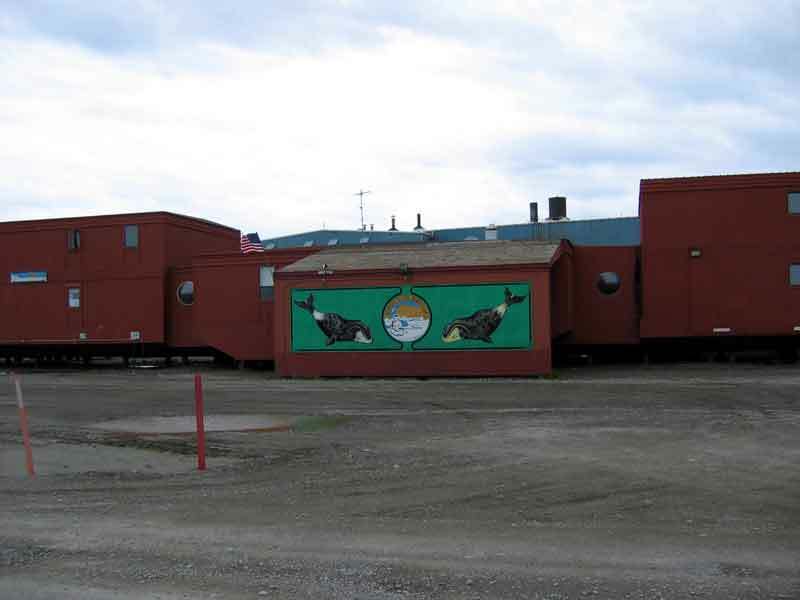 Left: Alaska has boroughs instead of counties and this is the offices of the one that covers the north slope. 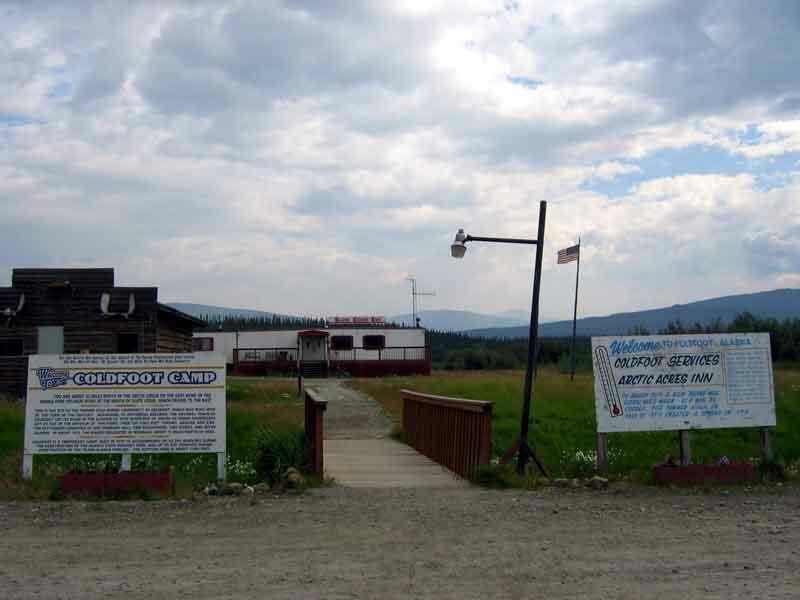 Right & below: General layout of buildings and tundra bogs. 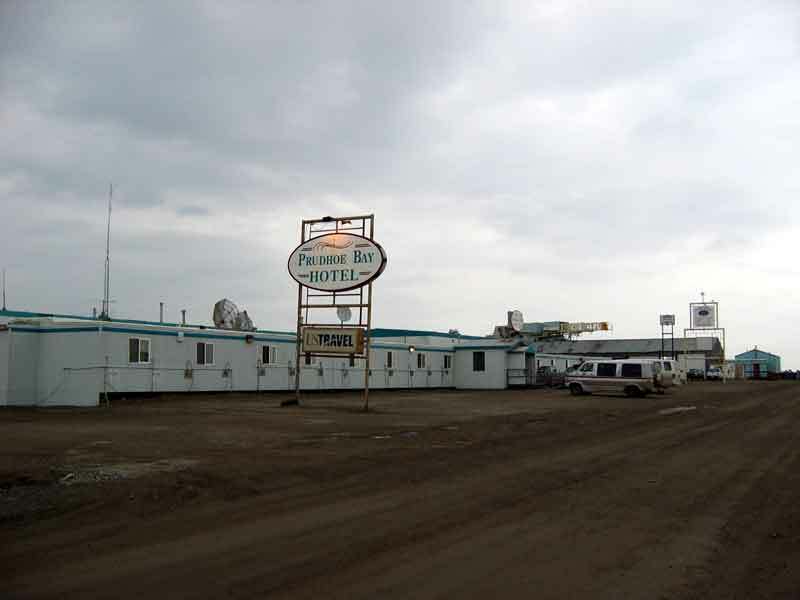 Right: This is the only hotel in our experience that closed because we didn't stay there! Actually they weren't very busy so they sent us down the road to the only other hotel which was also the only place to eat in the area. 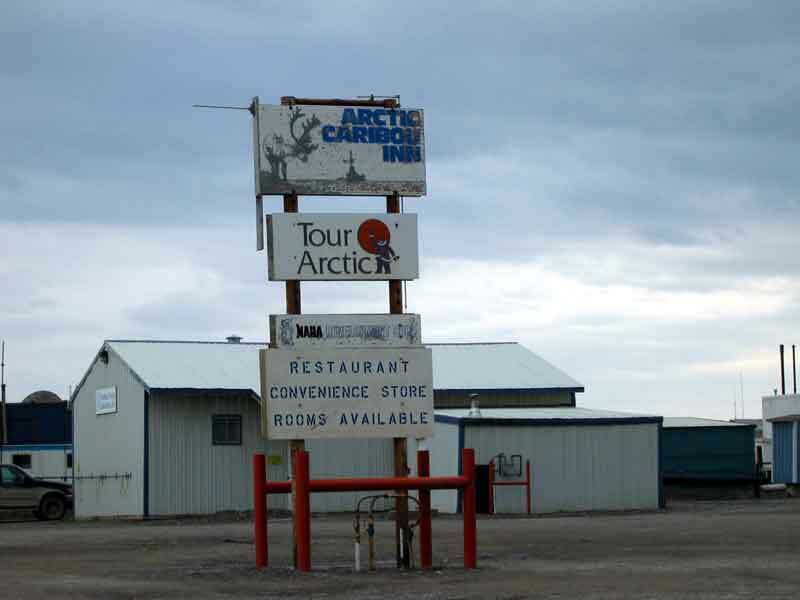 This one was only staying open to run the Arctic Ocean tours. Don't know why they didn't move this function down the road too. They did re-open if bus tours came up. 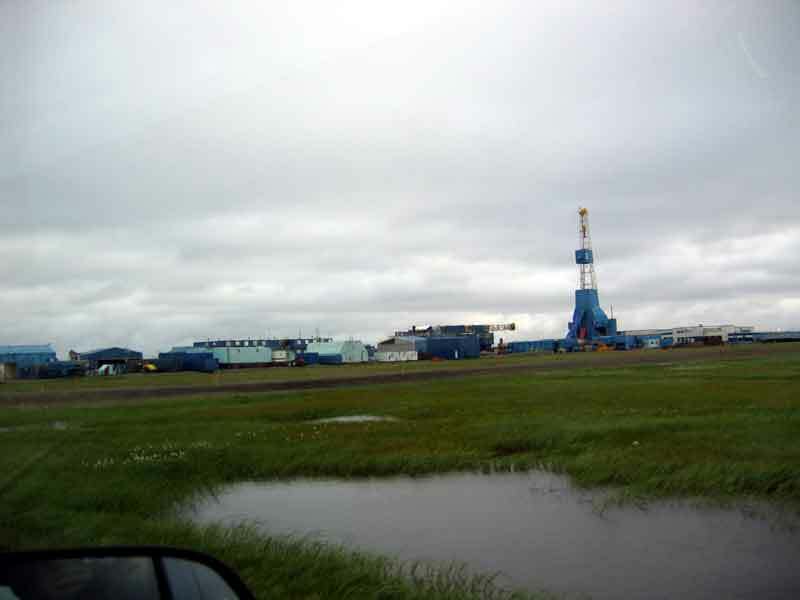 Left: Drilling rigs are parked here for maintenance and modifications and then rolled to the jobsite at 1-2 mph. 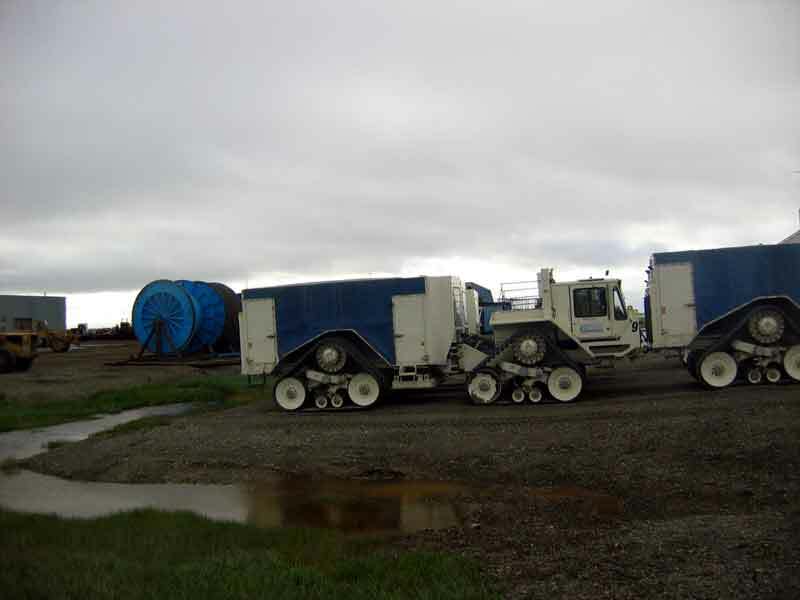 Right: These thumpers are used in the winter to generate seismic shock waves for oil field prospecting. 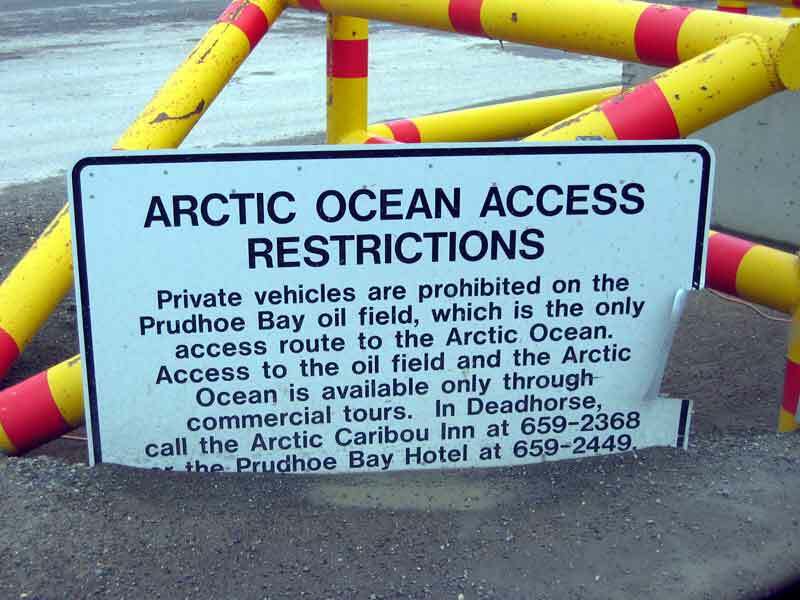 Left: You have to be on a tour conducted by a security person to enter the oil field and see the Arctic Ocean. 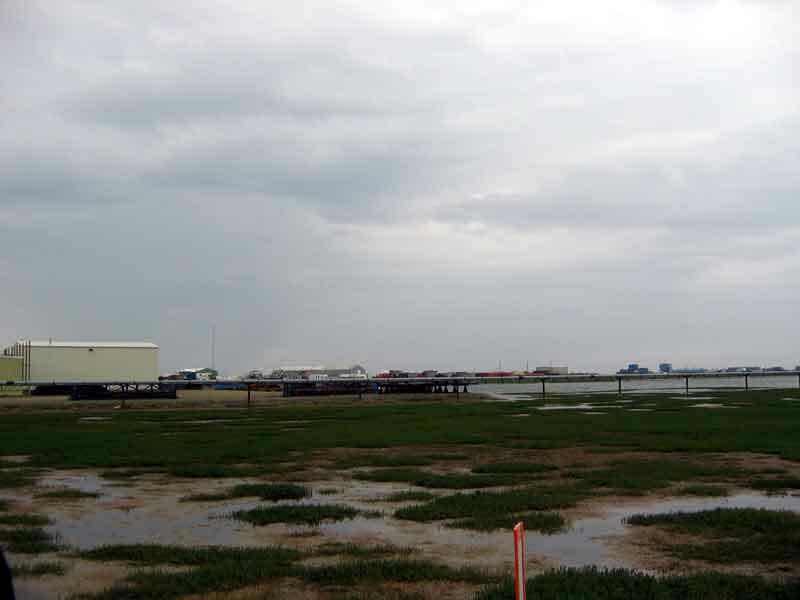 Left: We are on the east dock/spit looking back at the oil field operations. 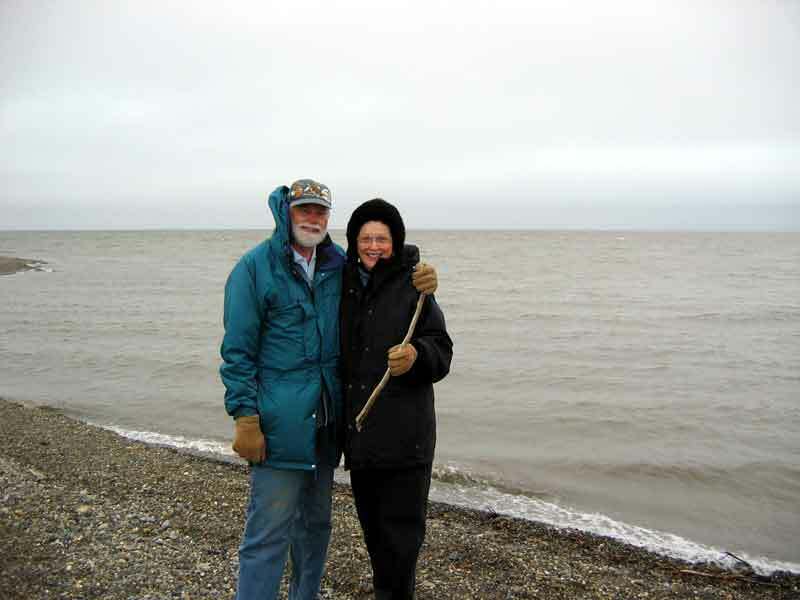 Right: We were just happy to touch the waters of the Arctic Ocean - No total immersion for us! 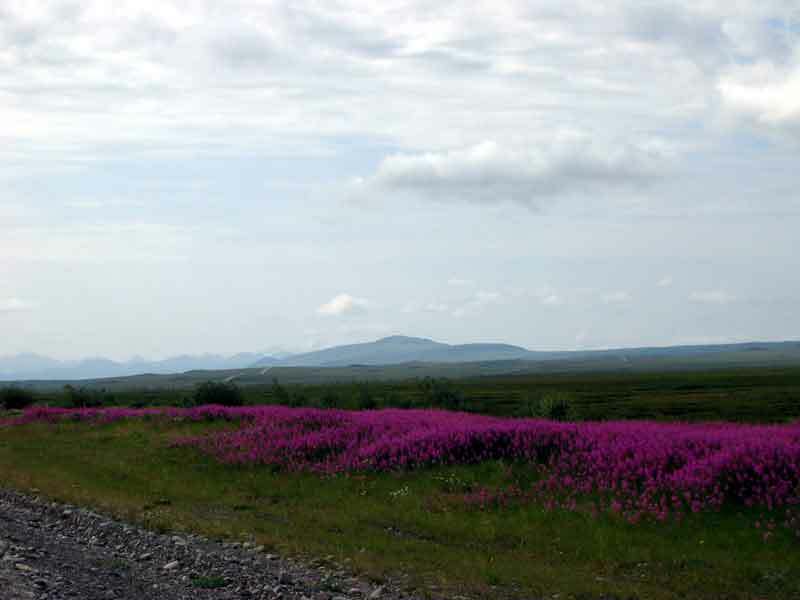 Right: Beautiful wild flowers along the side of the road. They were always on the west side.